Google has been working flawlessly so far even though get hit with millions of requests per hour. But not today. Every search results in Google search engine now tagged with “This site may harm your computer”. 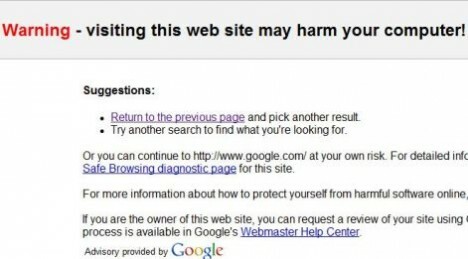 The direct links to the URL of the sites listed in the search results are been redirected to a interstitial page labeled “Warning – visiting this web site may harm your computer!” and various links to Google and StopBadware.org. To make matter worse, all major established sites are been labeled as possible harmful or malicious badware sites, such as Microsoft, Yahoo, My Digital Life, and even Google itself. Even localized Google search engines in another languages such as French, German, Japanese, Chinese and etc. are affected by the major bug. The bug appears to have happened for several hours, but not yet been fixed. It will only cause problem to webmasters though, as ads that appear with the search results appear to be working fine without problem. 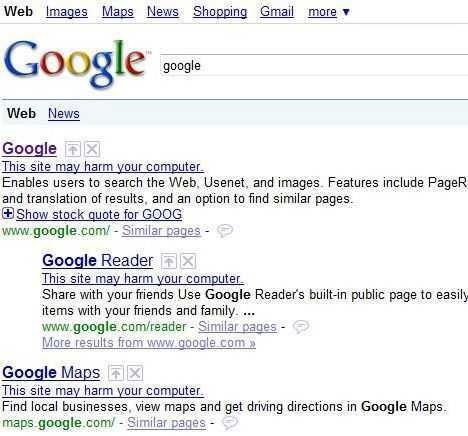 Only organic search results are been affected. Currently, the only workaround is to directly type in the URL into the address bar in order to access the website, or switch to Google Blog Search or Image Search or Google Mobile Search. More useful workaround is probably using Yahoo or Windows Live (MSN) Search.